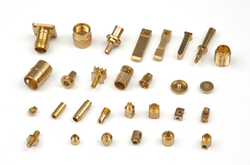 Prominent & Leading Manufacturer from Bhiwandi, we offer brass stopper pin of different sizes and brass components. We have emerged as the leading manufacturer and supplier of a wide range of Brass Stopper Pin of Different Sizes. The provided stopper is developed by our skilled professionals following high definition industrial standard. Offered stopper is highly efficient in preventing the doors from hitting the walls on opening. Our offered stopper can be availed in diverse technical specifications in a given time frame. With the assistance of our professionals, we have been able to manufacture and supply a wide range of Brass Components. This brass component is precisely developed by using finest material & modern techniques in accordance with the set norms of industry. 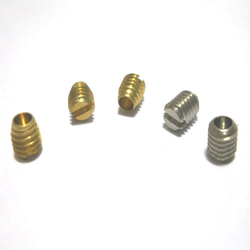 In addition, offered brass component is tested on various parameters in order to deliver a flawless range from our end. Our customers can avail this brass component from us at affordable rates.